Soda Pop Soldier will be on my list of my favorite books of 2014, you can count on that. I loved Ready Player One, and Nick Cole took that technological society and showcased it through a different lens. I reviewed it a couple months ago here. Thankfully you can get Soda Pop Soldier for much less right now. Just $1.99 for your Kindle copy. Michael Bunker says this is his favorite book of the year and I won’t disagree. Fantastic book. This is really one of those books you will read and want others to read as well. That’s what makes the $1.99 price point so great. Buy one for yourself and a couple for friends — all for less than the original price of the book. You don’t think I would do this without including my own book, on sale this week for just 99 cents? This was my first novel and the first in a planned trilogy. The sequel is also available and the third book is about 40 percent done. Dead Sleep tells a story of discovery with an action-fueled chase pushing the narrative. I was really inspired by Clive Cussler and Lee Child as I was writing this, with a definite sci-fi angle. Dead Sleep is 99 cents for the rest of the week. Paul Kohler’s Linear Shift is soon to get its third installment in November, so now is a great time to catch up on what has happened in Part 1 and 2. Kohler boldly takes on the time travel story, but takes his time setting the scene. Part 2 is longer and deeper than the first part and I fully expect the third story to really advance the plot when it drops next month. Right now you can pick up Linear Shift, Part 2 for just 99 cents. Not really a deal, but after reading it, you’ll feel like you got one. Nina’s first foray into self-publishing tells the story about Janey, a household robot. Of course, there is more to see than just a standard robot story and Tozzi really makes the reader feel. Janey X39: Rebirth is just 99 cents. You have got to check this site out. The Pulp-O-Mizer lets you create a Pulp Magazine cover with the aid of dozens of templates, backgrounds, characters, and fonts. There are a few limits, but most are in your imagination. 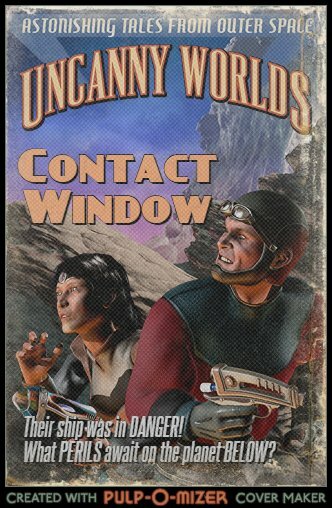 I got around to playing with it a little bit ago and quickly designed a fun, quirky cover for my first contact story, Contact Window. Behold! Today – in my first blog post in over a month (more on that later) – I’ll be giving you a DOUBLE REVIEW. That’s right – two reviews in one blog post. Good for you both books are by Australian author extraordinaire Peter Cawdron. Cawdron has had the book My Sweet Satan on Pre-Order for about a month now and it is just releasing this week. But, while we were all waiting for that book to drop, he snuck in another short story: Revolution. In Revolution, Cawdron paints a picture of a world similar to our own, but with technology advanced a bit. Alexander Hopkins is getting home on a red-eye flight from Russia when that world slams into him with all the force Homeland Security can muster. The breadth of the story is short, so I’ll keep my review brief as well, but you want to catch each word in this tale as Cawdron once again showcases why he is one of the best indie writers around. The pace of the story is at first lazy and perhaps a bit deliberate – much like the landing of a 747 after a 10-hour trip. Once Alexander is on the ground, however, the action picks up and you find yourself whipped around from one place to the next in a desperate attempt to survive and figure out what is happening. While the beginning of the story starts with lethargy, the ending is sudden and abrupt, stopping too soon for my taste. I wanted more, but isn’t that the mark of a great story? Now…on to My Sweet Satan. I’ll include my Amazon review in a moment, but I’ll first say I was hesitant to read this book. I am a fan of Peter’s and consider myself to be a friend as well. While I’ve read his work, he’s also read and critiqued mine and we both share a fantastic editor. But…that title. Say I’m reading it and my wife asks what I’m reading. How do I explain it? It’s hard to explain the title unless you’ve read the entire book, which is perhaps my greatest criticism of it. The book is tremendous. A fantastic achievement and my only concern for Peter is that less potential readers will pick it up just because a title like that might scare them away. Perhaps though, this is the ultimate test. Will someone read a book even with a potentially incendiary title? Will they bother to see if the text inside is worth the price of the three words on the front cover? Ultimately, the answer for me was yes. With a title like that, it was a little difficult for me to want to read this book. Peter Cawdron has made a title that is very provocative, but if the reader can just get past it — get to the heart of the story — they will realize that Satan has very little to do with this tale at all. I love Peter Cawdron’s work. I just adore it. I have been a huge fan of his previous books and was instantly drawn into the narrative he created in MSS. While I admit the title took me aback, it turns out the title, and the message from the stray moon of Saturn, are both a little deceiving. Deception is a key concept of this book, starting with our protagonist, Jasmine, or Jazz for short. In the process of a re-self-discovery, we are seeing the world through Jazz’s eyes, crisp and clear at times, but vague and confused at others. She is smart, but the years of college and learning to be an astronaut are gaps in her memory. She doesn’t know what to do all the time and turns to the only one she believes she can trust — the ship’s AI, Jason. I’ll say this about Jason — he may be the best character I’ve seen in a long time. I loved what Cawdron did in creating a character that feels totally real, but is not only fictional, but also doesn’t have a body to call his own. The evolution of Jason was fantastic and I would love to see more of him in a future book if Mr. Cawdron ever decides to revisit his MSS Universe. The story is well told, well-paced, and one I would recommend highly.